There’s something about a huge cast of tap dancers that is mesmerising. Whether it’s the sheer rhythm of the steps or the energy they create, you can’t take your eyes off them. And when the company in question is the superb cast of 42nd Street at Derngate you’ll be glued. The Northampton Amateur Operatic Company have pulled off a triumph with this, their 21st production at the 21-year-old theatre, putting on a show of such dazzling brilliance that it’s tempting to strike the word “amateur” from their name. From the opening “Back stage” audition number, through classics such as the sizzling title song, the joyous ‘Lullaby of Broadway’ or the foot stomping ‘We’re in the Money’, the pace and poise of their performance never lets up, producing a show that crackles with energy and fun. Lottie Minter is note-perfect as the naive chorus-line hopeful Peggy Sawyer who sees her Broadway dreams come true, although she has strong competition in the leading lady stakes from Lisa Simpson, playing fading star Dorothy Brock, Ms Simpson’s powerful voice was beautifully employed on the sultry ‘Shadow Waltz’, and she brought true star quality to the wishful ‘I Know Now’. John Simpson also excelled as theatre impresario Julian Marsh, bringing a film star quality to his role as the jaded boss. It is the Derngate theatre’s 21st birthday and the Northampton Amateur Operatic Company are currently performing their 21st show there. Their performance of 42nd Street opened Tuesday, October 26, to a packed auditorium and is at the Derngate until Saturday, October 30. 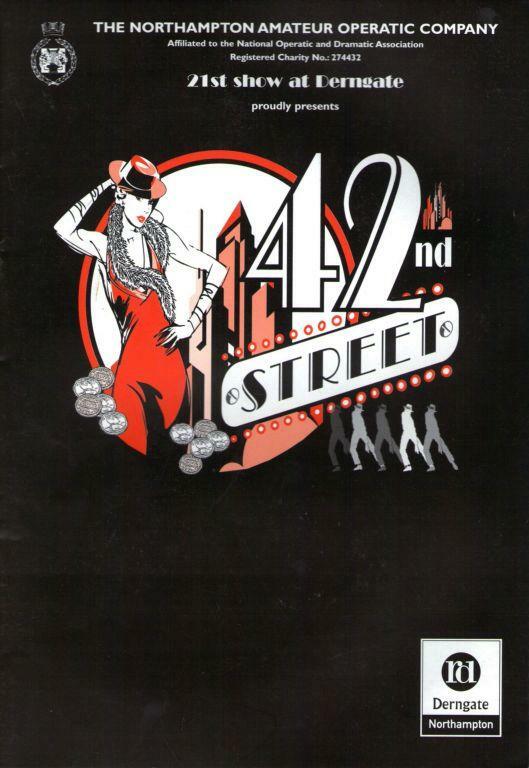 I went to see 42nd Street when I was younger and could vaguely remember some catchy songs and lots of dancing. The Northampton Amateur Operatic Company certainly delivered this and brought back some of my memories of the show. Everyone had clearly been working hard to perfect their choreography and the songs were as catchy as ever. The music was definitely one of the strongest features. The quality of the singing combined with the fantastic orchestra allowed the cast to deliver excellent renditions of “Lullaby of Broadway”, “About a Quarter to Nine” and “Shuffle off to Buffalo”. The many costumes helped to create the feel of the 1930s, and there were many wonderful designs, especially the sparkly outfits which embraced the glitz of Broadway. The use of space was also well thought out and allowed different locations to be created on stage. The actor playing the impresario Julian Marsh really embraced his role and excelled in it, in both acting and singing. The audience seemed to agree if the great applause that he got at the end is anything to go by. The actress playing Peggy Sawyer captured the innocence of the character and her ambition to appear on stage. Her interaction with the character Dorothy Brock was successful and their final scene together effectively showed an older star passing on her wisdom to the young beginner. One thing I noticed about The Northampton Amateur Operatic Company was how much the cast were enjoying it, which made a real difference when watching as you wanted to enjoy it with them. The whole company should be really proud of what they have achieved, and this show will be as successful as their many previous performances. I have to admit that I went home humming “Lullaby of Broadway”, and wondering if my old tap shoes would still fit.